Protostega gigas and other reptiles and fishes from the Kansas chalk. Wherein Charles Sternberg describes specimens he collected from the Kansas chalk during the 1903 field season and criticizes the original reconstruction of Protostega gigas by E. D. Cope. A related page: Sternberg, C. H. 1899. The first great roof. Popular Science News 33:126-127, 1 fig. AND FISHES FROM THE KANSAS CHALK. By CHARLES H. STERNBERG, Lawrence, Kan.
Read before the Academy, at Manhattan, November 27, 1903. IN his report to the United States Geological Survey of the Territories, volume II, 1875, Prof. E. D. Cope fully describes the material on which he founded the new genus Protostega. To me, after all these years, having collected many specimens of this large tortoise, it has been a wonder how he was able, from the bones he collected himself and restored with infinite care and patience, to make such a nondescript of the animal, especially as in volume IV he gives, as the most important law that governs paleontology, the persistence of type. But this creature, as he created it, is an exception to the rule. He makes the total length 12.83 feet, with width of carapace -three feet and length seven feet, or twice as long as wide. One mistake leads to another. The professor thought the skeleton he discovered lay on its back. The loose ribs doubtless did, as their heads were pointed upward. During the time it was being buried in the soft sediment they could easily have been turned over. I have found hundreds of specimens where the elements have been macerated free from their fellows, and lying in every conceivable position; in fact, it is rare indeed to find them in their natural position. With this idea firmly fixed, he proceeds to put the great radiated bones of the plastron in the skin of the back as lateral dermal plates, along with some of the bones that cover the top of the skull. In describing the plates, he notices they were concave on the under surface, yet the ribs were flat and straight. It is useless to try and understand how he could have made such mistakes when he had so much of the skeleton present. For many years his description remained uncorrected, though in 1876 my party sent him a nearly complete skeleton. get them in their present condition though I was very anxious to show you the whole skeleton, it was a physical impossibility. It will take another month to scrub off the tenacious blue shale in which they were buried. The whole animal was originally present. It lay on its back, every bone in its natural position, though sadly broken by the disintegration of the shale; one fore limb, from the humerus outward, and the end of the skull were cut off by the wash. It therefore gives me great pleasure to introduce you to the fellow who has been so cruelly misrepresented during his absence. He will tell you. the truth, and as I hope will be a warning to paleontologists to know what they are talking about before they rush into print and give a false representation of one of Gods creatures, as it may turn up, as this has done, to make their labor vain, and give young paleontologists a chance to rise in the world on the mistakes of their predecessors. So after these many years of doubt and uncertainty as to his structure Mr. Protostega comes before you in his own person to prove to you that scientific literature is full of science falsely so called. My discoveries have often proved that when men of science guess on the structure of an animal which they only know in part they usually guess wrong. Our works on paleontology are full of such errors as Cope made, proving that the ablest minds, when they draw on their imagination for scientific material, drop into the same class to which Professor Hicks belongs. When they try to force facts to carry out some preconceived theory of their own, as to how nature should do things, the unexpected is likely to happen; the animals themselves may come forward to prove that, man cannot describe correctly an animal he never has seen. It is said the Japanese can take our most complicated machinery to pieces and build as many exact duplicates as they wish, but they cannot invent. So all a paleontologist can do is to give a description of what he has seen. To go beyond this is guesswork and of little or no value. Knight has given, in the frontispiece of the University Geological Survey of Kansas, volume IV, a restoration of this turtle as he supposed it to be, from the study of Cope and others. He makes the flippers three times as long as the hind paddles. 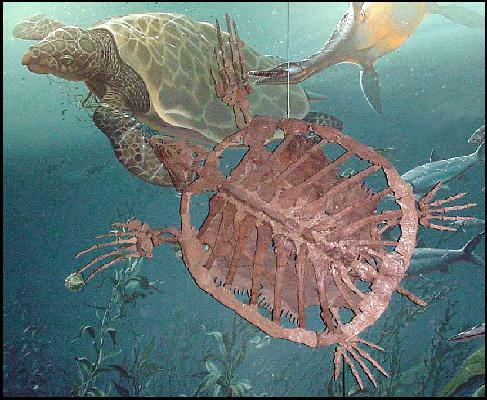 With a completely ossified carapace, you may therefore be surprised to find that the hand in the turtle before you (see plate XVIII), by actual measurement, is only three and an eighth inches longer than the feet. The third finger is the longestsixteen and a half inches long; the fourth, fifteen and a half; the second, fourteen; the first, nine a half, and the fifth, eight and a half inches long. The second and third toes are twelve and five-eighths; the fourth, twelve and an eighth; the fifth, eight and an eighth; the first, seven and a half inches long. Professor Williston has restored a limb of this species in the University of Kansas from a lot of loose and scattered bones I collected some years ago; in the presence of this animal he was mistaken. The professor assumed the position of a land turtle feigning death; his limbs were drawn within the marginal plates as far as the hands and feet, yet in this position the distance between the ungual phalanges of the hands is over eight feet. When stretched out at full length, with the great horn claws added, the span would be nearly ten feet; so that Cope was about right in his estimate of this part of the skeleton. In the neck and carapace there are twenty-three vertebræ, three feet and nine inches long. There are also present three caudals, measuring five inches more (see plate XIX). 126 KANSAS ACADEMY OF SCIENCE. up entire, resembling a hub and spokes with the felloes taken off. Only, in this case, the hub would be represented by the string of anchycolosed vertebræ. I have a much older individual that I described in Popular Science [News], June, 1899. The specimen was so badly broken that I did some guessing myself, and figured an oval carapace with only sixteen ribs. In this specimen the neurals are beautifully sculptured, rising in the center in rounded prominences like inverted wedges, with blunt apexes, divided by narrow valleys. The carapace is, in this specimen exhibited, about four and a half feet long and forty-five inches wide. Compared to the enormous pectoral and pelvic arches and powerful limbs, the body cavity was remarkably small. I suppose these huge limbs were developed more as a means of defense, offense, and rapid swimming, than to enable him to appease his appetite. The sharp elongated claws and horn-armed jaws would likely meet with the respect they were entitled to by his neighbors, the mosasaurs and large predaceous fishes. After a few more months of labor I hope to be able to restore the remaining parts of this specimen. When a correct description is made, paleontologists will be able to get a true idea of one more of the ancient inhabitants of Kansas. believes, So I am led to think Cope was right when he suggested that this animal had the power to spread his mandibles laterally, to force food down a loose, baggy throat. Then, I have a nearly complete skeleton of the large Platecarpus coryphaeus. I never get tired of talking about these old Kansas mosasaurs. But as they are so well known, I will tell you of a skeleton I was able to secure of the great predaceous fish, Copes Portheus molossus. This was discovered several years ago by my friend, Mr. W. OBourne, of Scott City. He entertained me every time I came to town in his pleasant home, surrounded by beautiful trees. His estimable wife and he did all in their power to make me forget the hardships of the fossil fields, and I returned to them with fresh courage. My son George rediscovered the specimen, with several tons of loose dirt on top. I consider this specimen better than the one I sold the American museum, Central Park, New York, in 1900. Professor Osborn had it mounted by his skillful assistant, Mr. Adam Herman, and I take great pleasure in showing you a fine photograph of this specimen. Public Opinion, page 896, December, 1902, says: It is the most striking specimen of a fossil fish to be found anywhere in any museum in the world. In this photograph the dark shades represent the bones I collected, the light shades the parts restored, using the skeleton of a living tarpon for comparison. And it would seem that this restoration could be safely made when so much of the skeleton is present. Yet my more complete specimen shows that there were no additional spines in the dorsal line. They were V-shaped. The proximal ends of the limbs were provided with rounded heads, that fit in bowl-like depressions in the centrum of the vertebra. The distal end was sharpno room for extra spines. Further, some of the spines in the caudal region were double. This individual of mine occupies three large panels of its native chalk. The complete head, gill bones and pectoral arches are the most perfect of any I have collected. The distal ends of the pectoral fins are cut off by the wash, with a few of the ends of the ribs in this region. All the proximal ends and many complete ribs are present, with all the spines of the vertebræ. Both the pelvic and dorsal fins are present, but unfortunately the tail fins are missing. I hope the museum that procures this specimen will be able to get a cast of the tail fins in the New York museum, as that individual seems to have been of the same size as this one. I have twelve feet of the skeleton, but the one in New York is sixteen feet long. So I am truly delighted that in these two specimens men of science will at last get correct ideas for the first time of this great fish. 128 KANSAS ACADEMY OF SCIENCE. was my chief assistant in the field. He discovered many of the best specimens we collected, and his skill in handling the large panels we took up showed great forethought. He loaded my large collection on the car and stayed with it until it was safely delivered in my workshop at Lawrence. Mr. W. A. Anderson, whom I hired in the field, proved an efficient helper. I close with an invitation to you all to visit me in my laboratories and examine some of the ancient inhabitants of Kansas.